I'm so excited to have a guest post friend today! I sort of "met" Kristen in an online Resource Party with Alt Summit. 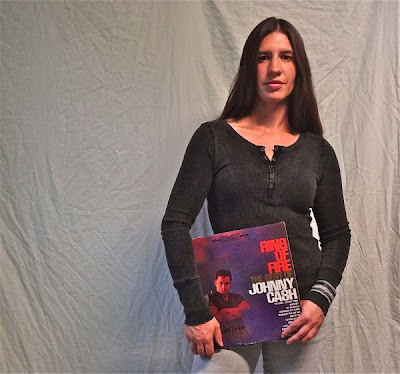 I posted about wanting some guest posters, and right away she emailed me with the idea to share some of her (amazing) record collection and maybe an inspired outfit to go with it. What a fantastic idea, right! So here you go. Please meet Kristen. I'm going for the straight faced sullen look. Johnny doesn't smile on his album covers. He is a serious guy. Johnny was know as the man in black and he wore a lot of denim. If you wanna represent, it's pretty easy. I put on my gray denim jeans and a black top. I made a bracelet to top off the look. 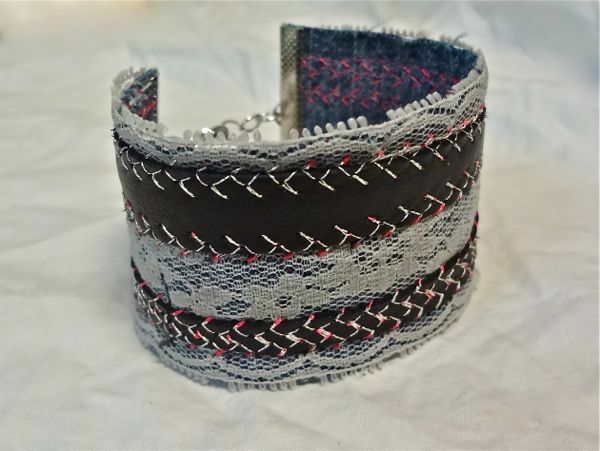 My Johnny inspired bracelet has a denim base with gray lace and black leather strips stitched on with silver thread. You can see the pink thread used on the backside peaking through the top. I've amassed a decent sized record collection since I first took an interest at age 15. I've got something around 300- 500 records sitting in my basement. It's about half decent stuff half stuff I may never listen to again. 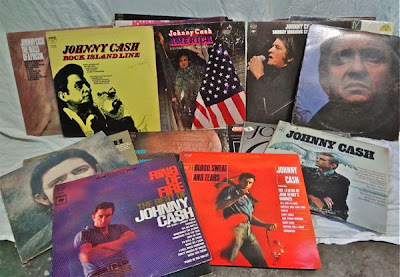 My biggest individual collection is my Johnny Cash records while I have no where near everything he put out I do have 35 of his records. Only a few are repeats which are good incase one has a scratch. The Johnny Cash library is endless, the American recordings he put out towards the end of his life are great but here is a top 10 list to get to know the guy if you're not familiar. Kristen Weigand lives in Kansas City, MO with her daughter Gretchen and dog Gwen. She writes a sewing and crafts DIY blog over at www.ola-maes.com. Shop her bracelets at www.etsy.com/shop/olamaes. Thank you so much Kristen! I just love that Johnny Cash inspired wrist cuff. You can find many more creative bracelets at her etsy shop, so go take a look! And how about that record collection?! Crazy jealous. Thanks again, Kristen. Kristen my husband LOVES Johnny Cash. He'll watch documentaries over and over again. He's seen walk the line a million times. He'd be so jealous of your record collection lol. I like the touch of pink on the bracelet, gives the Johnny look a little femininity. My favorite pre-American Records recordings are Jackson and Sunday Morning Coming Down.